A motorcyclist who was killed in Encinitas over the weekend when he crashed into a sheriff's patrol car has been identified as Valhalla High School cross country coach Carter Yarborough. ENCINITAS (CNS) - A motorcyclist who was killed in Encinitas over the weekend when he crashed into a sheriff's patrol car has been identified as Valhalla High School cross country coach Carter Yarborough. Yarborough, 48, was traveling northbound at a high speed on South Coast Highway north of C street when he struck a southbound sheriff's vehicle that entered his lane after turning left, according to the Medical Examiner's office. The crash occurred around 11:30 a.m. Sunday. 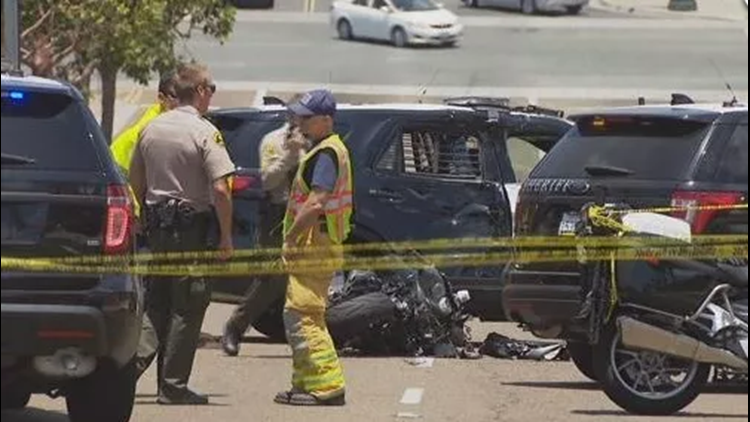 The motorcycle struck the rear passenger side door of the deputy's car, San Diego County sheriff's Lt. Amber Baggs said. No officers were injured in the crash, but Yarborough died at the scene. A memorial mile run in Yarborough's honor has been scheduled at the school for 6:30 p.m. Friday, the school announced on its Facebook page.